HINCHINBROOK (AUS) (Bay 2007-Stud 2011). 2 wins at 2, AJC Skyline S., Gr.3. Leading Aust. First Season Sire 2014-15. Sire of 141 rnrs, 71 wnrs, inc. SW Press Statement (BRC JJ Atkins S., Gr.1), Whispering Brook, Samara Dancer, Flying Jess, Spright, Flippant, Manaya, SP Derryn, Knowable, Salsonic, Super Too, Brazen, Brooklyn, Old Trieste, The Virginian, Un de Sceaux, Brulee, Rhi's Rocket, Diamond Tathagata, Nina Peak and of Madame Moustache, etc. Natural Dancer (f. by Zizou). 8 wins-1 at 2-to 1050m, A$239,090, to 2016-17, BRC You've Got the Winning Edge P., Mount Alvernia College H., 2d GCTC Bat Out of Hell H., BRC Coca-Cola Amatil H., Bank of Queensland Wynnum H., SCTC Coastline BMW 5 Series H., 3d BRC Quest Breakfast Creek H.
Tosamba (Woodman). 4 wins to 1400m, A$138,460, VRC AFL Life Members H., MRC Veneda H., Ark Regal H., 2d MRC Barbara Dyer H., VATC Lord Dudley H., 3d VATC Blue Diamond Prelude (c&g), Gr.3, SAJC Queen Adelaide S., L, MRC Flying Halo H., 4th VATC Tupperware Cup, L.
WOPPITT (Danzero). 5 wins-2 at 2-at 1000m, 1050m, A$252,824, SAJC South Australia S., L, MVRC Spotlight You Can Make It 2YO P., Legends After the Last H., Pulse Pharmacy H., Lindt Excellence Sprint H., 2d MRC Quezette S., L, Pamela Hutterer H., MVRC Gorski Truck & Trailer Flying H., Pulse Pharmacy H., 3d MRC Anna Carlovna H., MVRC Simpson Construction Sprint Heat H., TEAC Flashback LCD H., Keilor Hotel H., Pulse Pharmacy Flying H., MRC Chaise H., Shizu H., 4th MRC Blue Diamond Preview (f), L. Producer. Storm at Midnight. 3 wins-1 at 2-at 1300m, 1600m, A$77,120, MVRC Camp Australia H., Zonda H., 2d SAJC The Truth H., 3d VRC Ten News H.
ASTRODAME (Flying Spur). 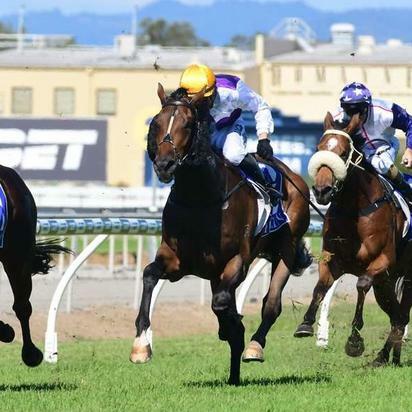 4 wins from 1200m to 1600m, A$515,925, MVRC WH Stocks S., Gr.2, VRC Maltby H., RSL P., MRC Clamms Seafood Classic H., 2d MRC Angus Armanasco S., Gr.2, VRC Frances Tressady S., Gr.3, MRC Autumn S., L, Bint Marscay 2YO H., 3d VRC AV Kewney S., Gr.2, Rose of Kingston S., Gr.2, Matron S., Gr.3, MRC Tranquil Star S., Gr.3, Boronia S., L, VRC Western Health Cup H., MRC Classic Caulfield Ladies' Day Vase H., Archie Yuille 2YO H., 4th VRC Edward Manifold S., Gr.2, MVRC Woodstock Mile Oaks, Gr.2, WH Stocks S., Gr.2, VRC Let's Elope S., Gr.3, Waltzing Lily H., L. Producer. MAHISARA (More Than Ready). 7 wins-3 at 2-to 1500m, A$527,640, MRC Sandown S., Gr.3-twice, Qld Tatt's RC Australia Post S., L, ATC TJ's Champagne Bar 2YO H., Iconic Race H., VRC Headquarters Tavern P., 2d BRC Sprint H., Gr.3, VRC Hilton Hotels S., L, BRC Dalrello S., L, 3d BRC Sires' Produce S., Gr.2, ATC Brian Crowley S., L, 4th GCTC Prime Minister's Cup, L.
ULMANN (Sebring). 5 wins at 1400m, 1600m, A$348,200, to 2016-17, VRC Paris Lane H., L, Daniel Maher H., MRC LUCRF Super Supports Jockeys H., William Hill Chocolate Hangover H., 2d Sunshine Coast Guineas, Gr.3, VRC Sofitel H., L, MRC Ladbrokes.com.au H., Sale TC Inglis 3YO Trophy, 3d MVRC Schweppes Crystal Mile, Gr.2, Ipswich TC Eye Liner S., L, 4th GCTC Gunsynd Classic, Gr.3, MRC Testa Rossa S., L.